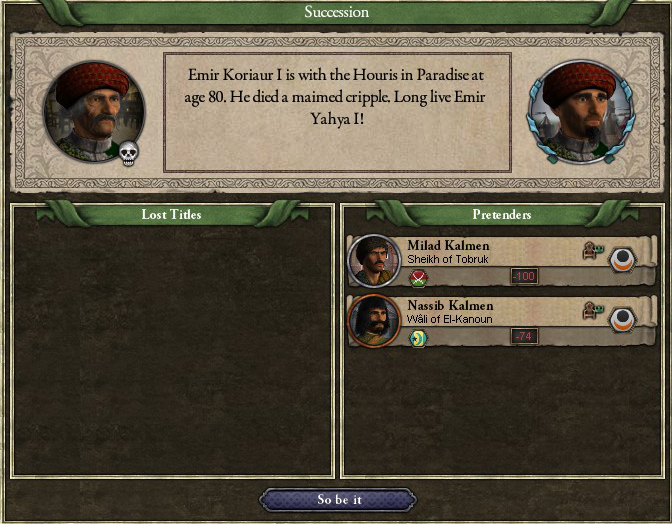 You know, I really liked your father, but you’re pretty awesome, Yahya. You’ve got gusto! Those forty-five hundred men in the north east are not Biktorid troops, but a peasant revolt stirred, in part, by your covert dealings. Though hostile to you, they are also hostile to the Biktorids and Tulunids, giving you a diversion and time to draw this war for Aswan to a close. In your favour of course. Captain Dionisii of the Bulgarian Band mercenaries, has been captured in battle, dealing a huge blow to the Biktorid military effort against you. Their army retreats into Fuktat, and the war is all but over. 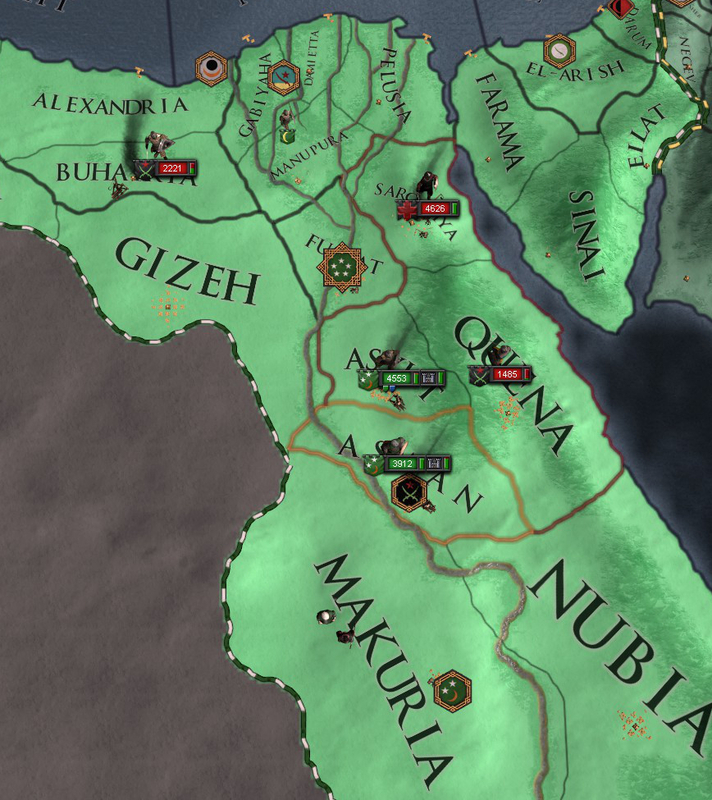 The Siege of Aswan ends and you control the province. 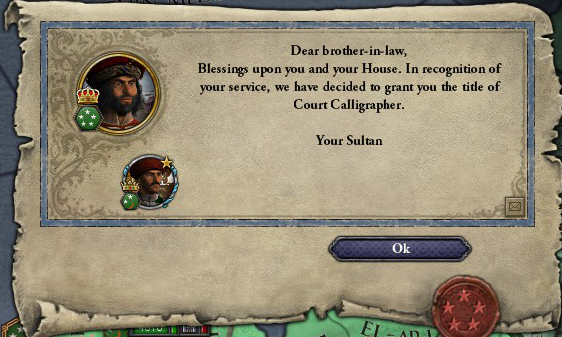 What else can I take for the Sultanate? 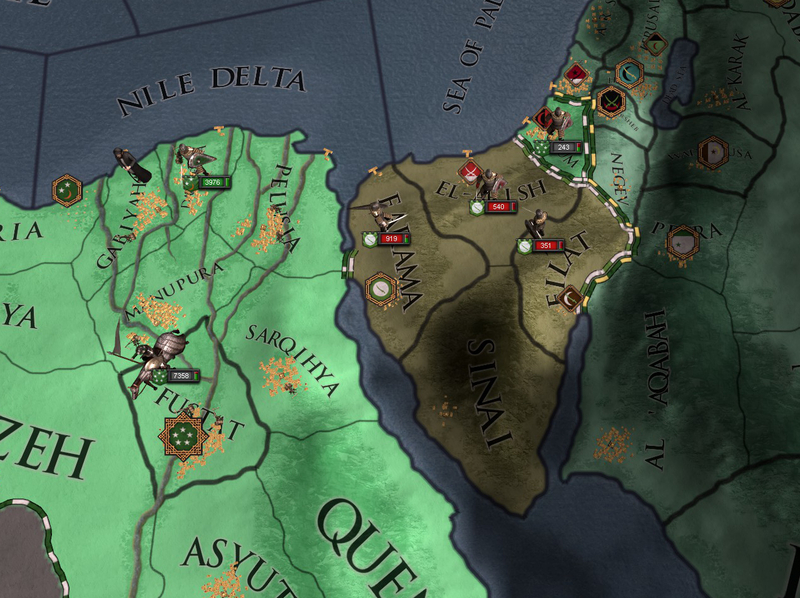 Uh… There’s a province in the Nile Delta. 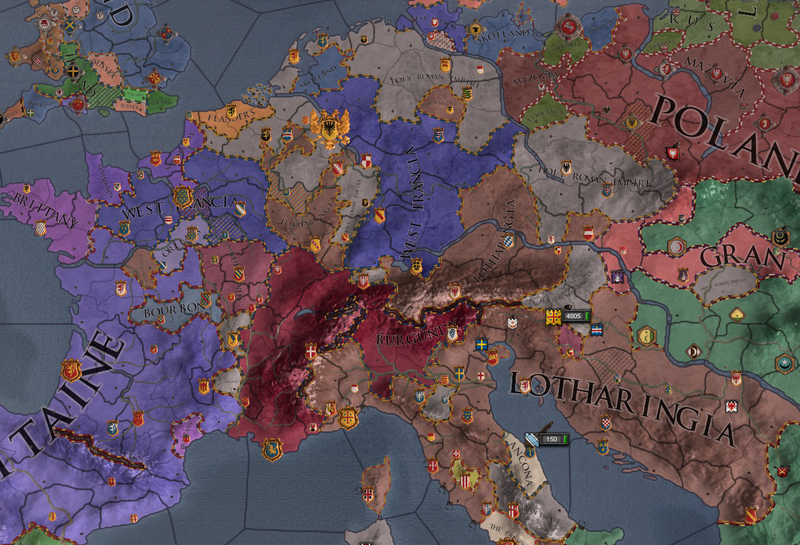 Uh… there is still a peasants revolt going on. They have two thousand men left after facing off against Biktorid troops, and they are laying siege to Fustat. Which is the home of the Tulunid Dynasty. I’m going to let that play out. I don’t mind if the Tulunids fall apart. Of course not. 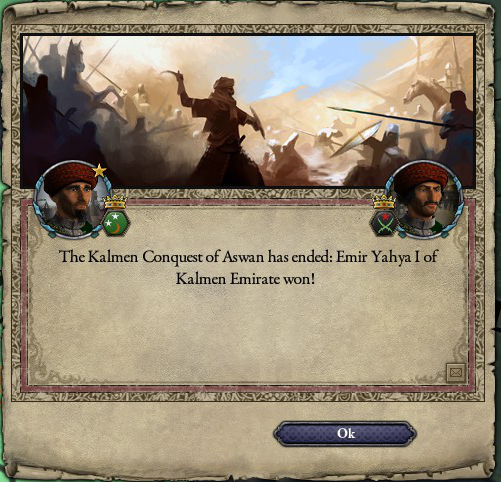 So, war with the Bilbaysid Emirate! Meanwhile, the war in the west has finally ended with Tulunid victory. 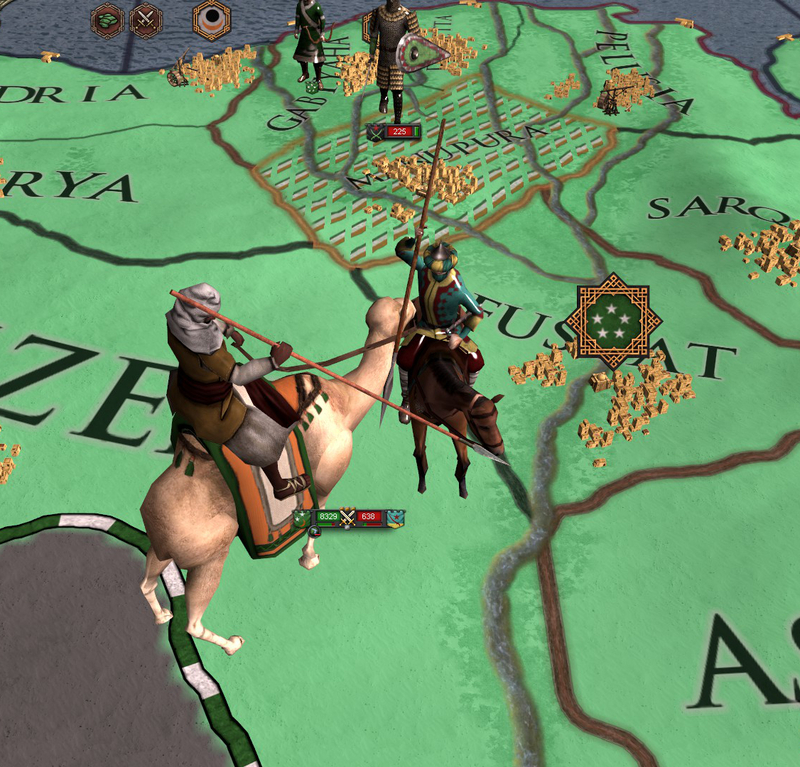 Latif, now no longer a child but come of age, returns at the head of ten thousand men, heading straight for the peasant army surrounding Fustat. 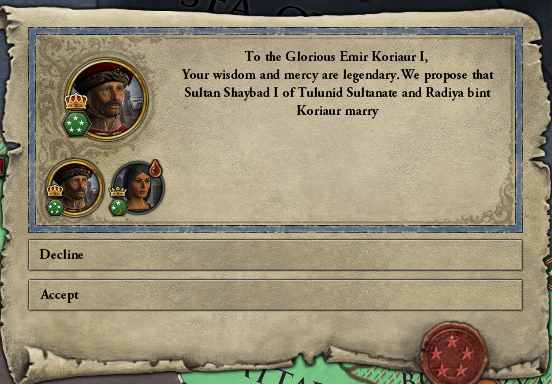 So long as he refrains from meddling in my affairs, I will let him rule Egypt. That’s rather audacious a thing to say! I like you more and more as time goes by. That’s all I ever wanted in life. The approval of a voice in my head. When have I ever displayed a sense of humour? Nope. Still don’t believe you. You’re yanking my chain! And you’re observant! 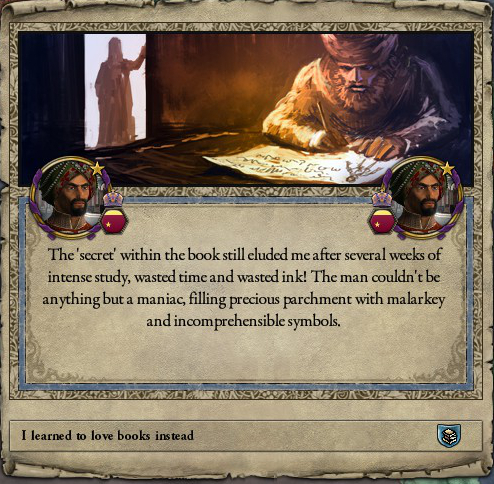 You can learn and everything. That’s okay! We can take ’em! We may need some mercenaries. And after all these wars, we are running low on funds. Dude, you’ve been doing so well so far! You’ll find a way! We’ll catch them as they remain exhausted and injured from the battle in Fustat. We have nearly as many troops as the Tulunids, though they don’t need mercenaries to reach an army of ten thousand. 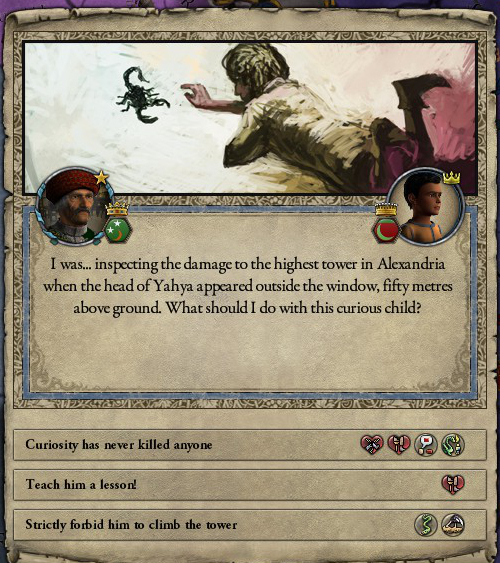 While I like the aggression in you Yahya, promise me you’ll take it easy after this. We need to relax, recuperate. It took a bit of manoeuvring, but I drew the enemy force into battle and crushed them. Simple. Simple. Yeah. That’s the word. 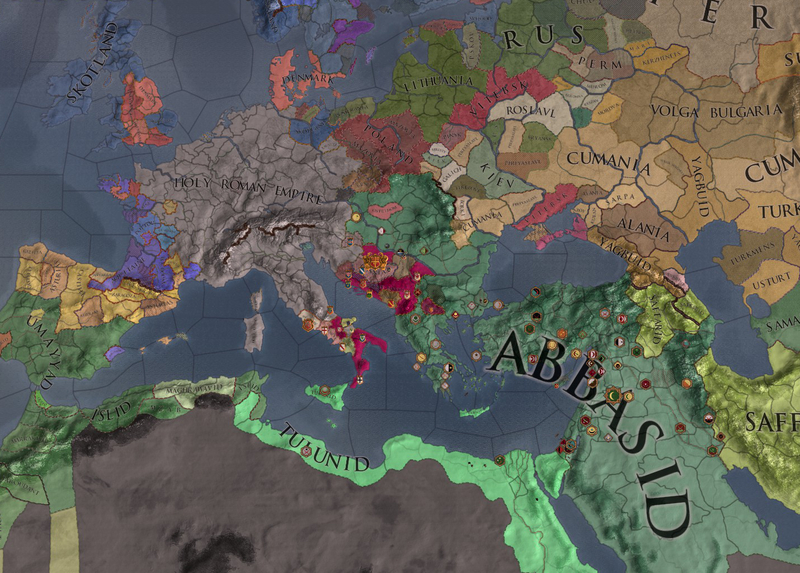 The Caliph of Arabia has died, and a new Caliph takes the helm of the Abbasid Dynasty; Caliph Ramadan. 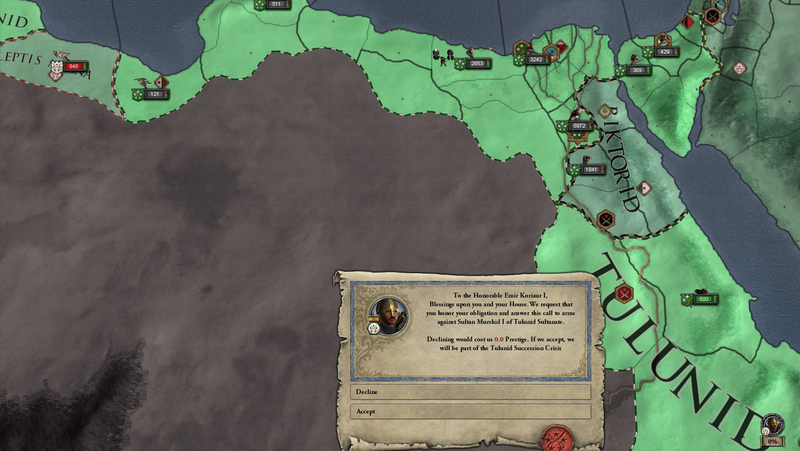 Ramadan has lost his grip on his decadent family, resulting in a situation very much like the Clusterfuckian War of Succession in Egypt; he has three brothers, all claiming the Caliphate. 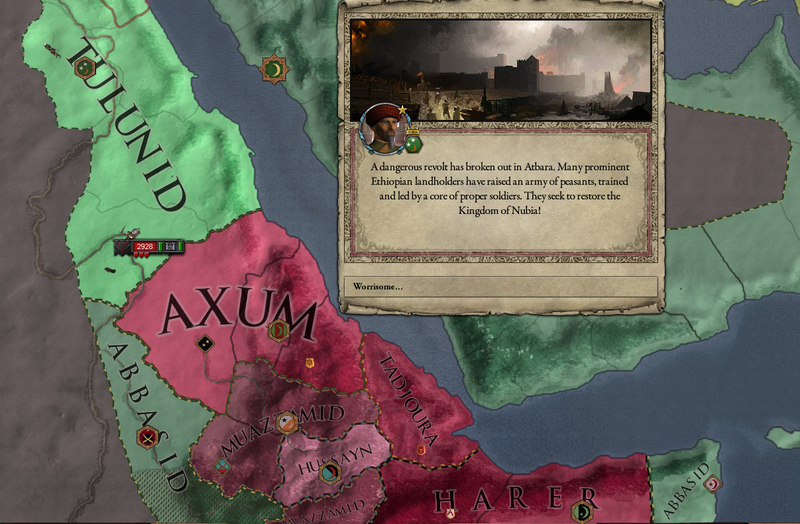 Meanwhile, in the far east of the Abbasid Empire, Persian lords seek independence and have split off. In the south, in former Abyssinia, a dozen petty Ethiopian leaders have secured their own independence. This has caused a bit of trouble in your southern provinces, particularly Nubia and Atbara. I’ll deal with them in a second. 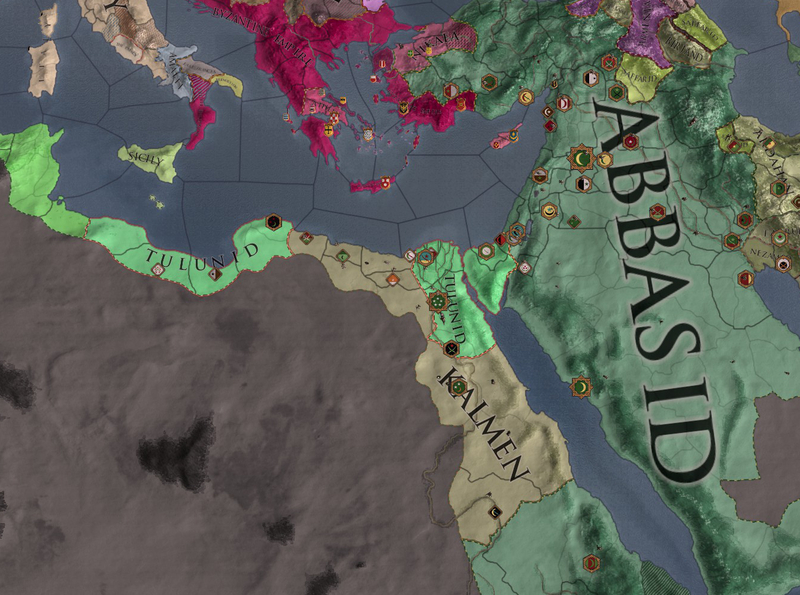 Well, with Abyssinia fractured and already at war with the beleaguered Abbasids, we could probably carve more Kalmen land out of our southern neighbours. Though you have some domestic issues to take care of as well. 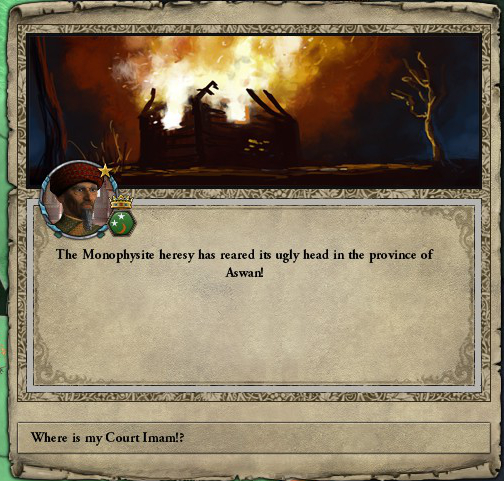 Where is the Court Imam, anyway? Hmm… Well, leave him be then. 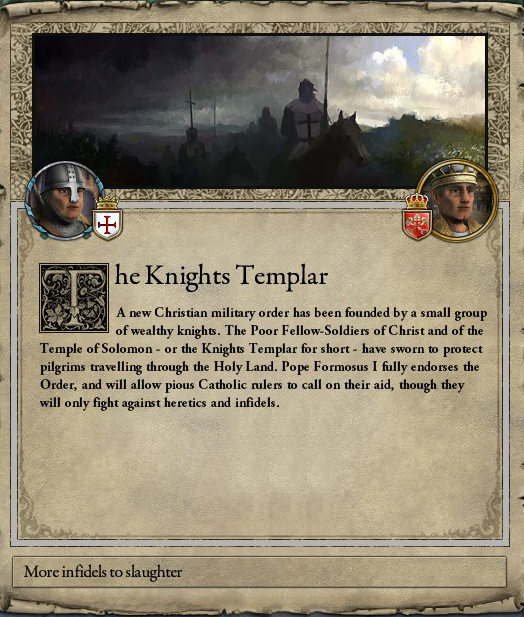 I’m not afraid of a heretics revolt. I’ve already won that war. What’s next? 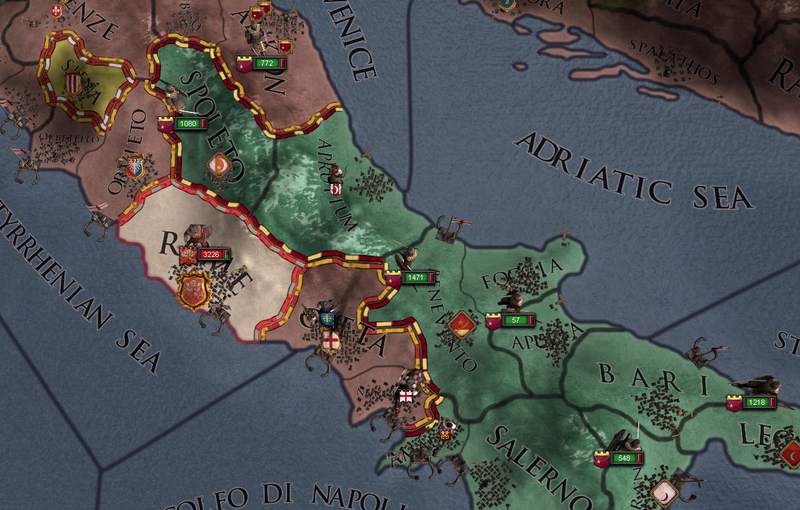 Uh… We could keep going south? Sultan Latif has called a tournament to bring together all the people of Egypt. Nuraddin has earned third place! While there, Latif spotted your daughter, Zara bint Yahya. Sorry, what? I wasn’t paying attention. You know what? I’m not even surprised anymore. You’re very good at killing people, aren’t you? 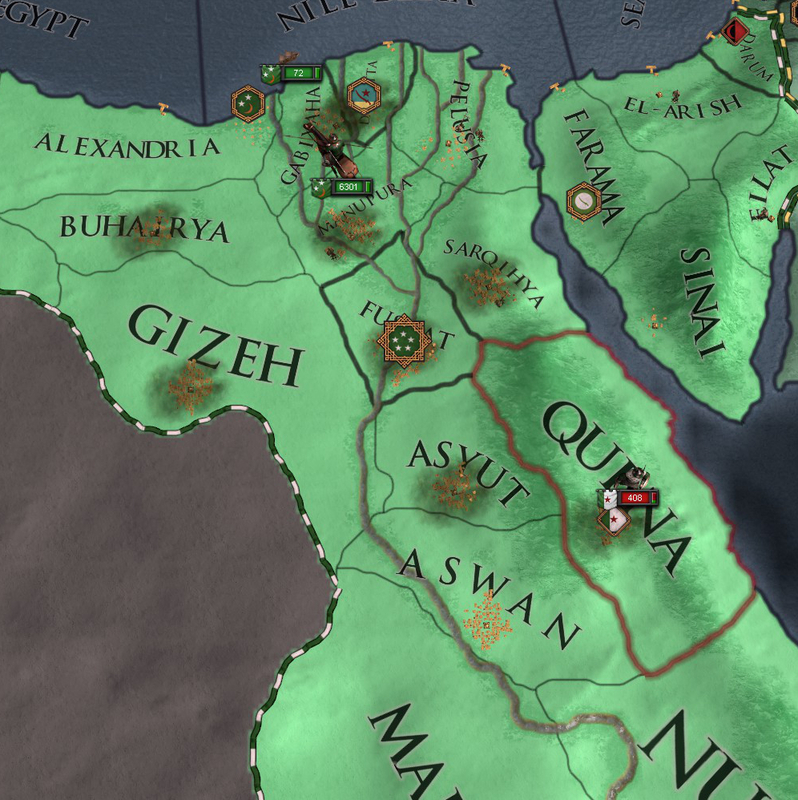 The Abbasids want Abyssinia back. Hold the line! Never give up, never surrender! Well, we are definitely losing this one. Sorry dude. Even after Sultan Latif joined in, we are outnumbered ridiculous-to-one. Hey, you can’t win ’em all, right? NEXT TIME: Winning it all! Farewell, buddy. I miss you already. I do not have time right now, spirit! My insane half-brother Milad is marching out of Tobruk. Nassib has joined him. I must crush them. 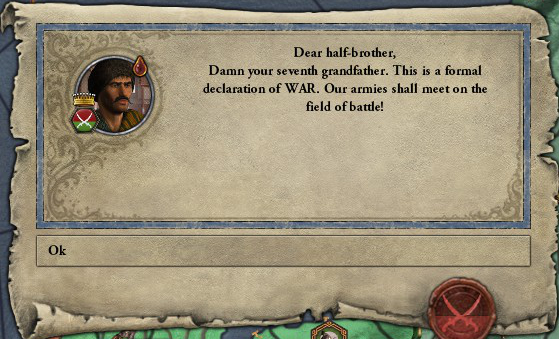 Isn’t your seventh grandfather also his seventh grandfather? Whatever. Isn’t this just dandy? The body of your father is hardly cold and already the family is squabbling over the scraps of his Emirate. I will be King of Nubia, one day. 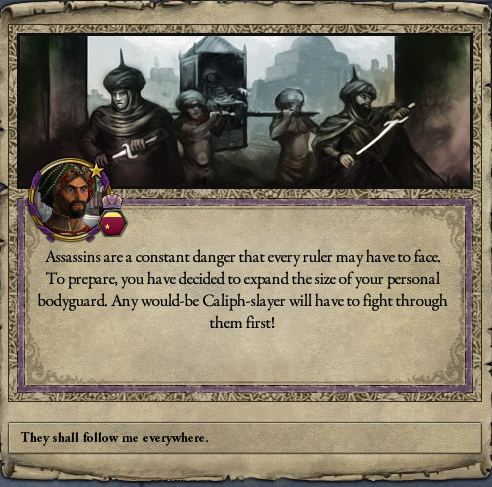 A petulant half-brother of mine will not get in my way. Clearly! What are you going to do with his land? He is a traitor and deserves none of it. I will give it to my own family. Speaking of family, let’s take a look at yours! 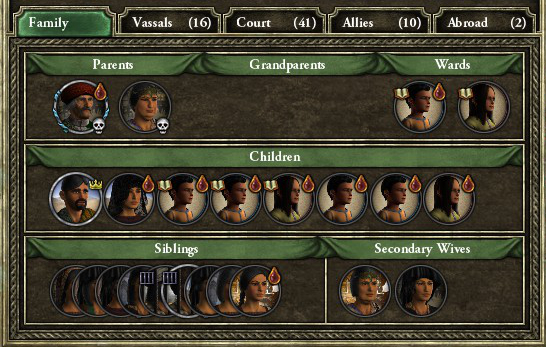 As you can see, you have quite a few sisters. Both your remaining brothers are ‘imprisoned’, but the game only displays it like that because they died in your dungeons. 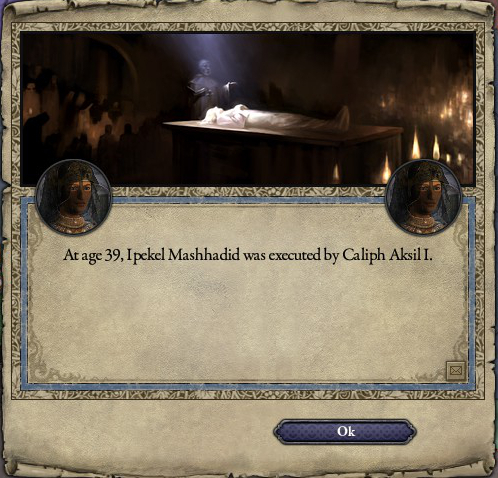 Both Nassid and Milad have been executed on your orders. You also have a great many children. 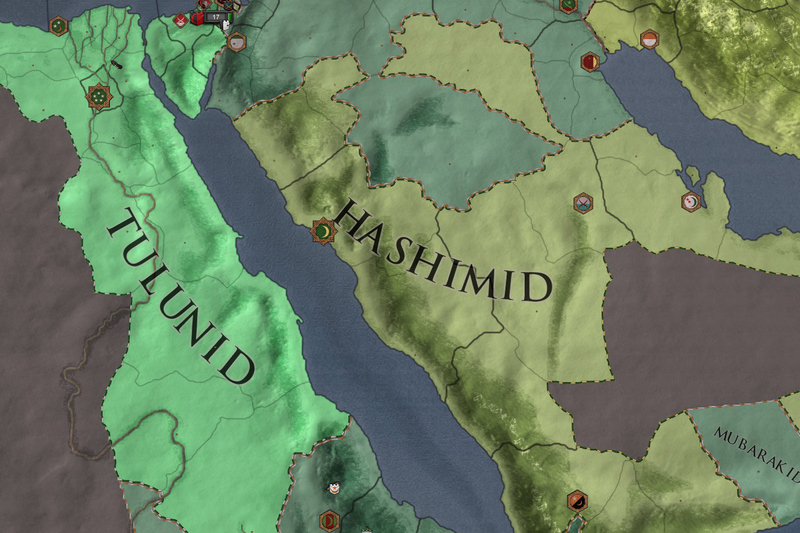 Let’s look your heir, Sheikh Nuraddin. 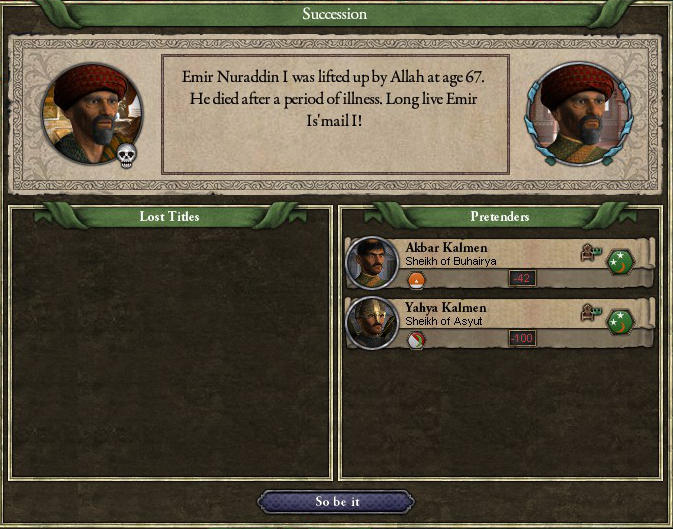 Nuraddin is a Mastermind Theologian and has some children of his own. His siblings are your children. Otherwise, he is nothing special. However, lets take another look at you, Yahya. What’s your Ambition? Well that’s cool, I guess. But there is one small snag in this plan. Namely, the creation requirements for the Kingdom of Nubia. What I do is not subject to your review. 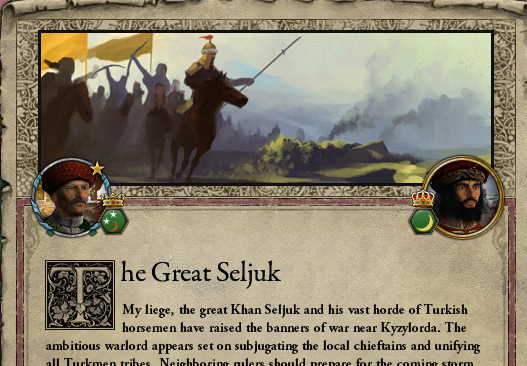 Like, um… declaring war on Sultan Murshid? He insulted me. He insulted my son. 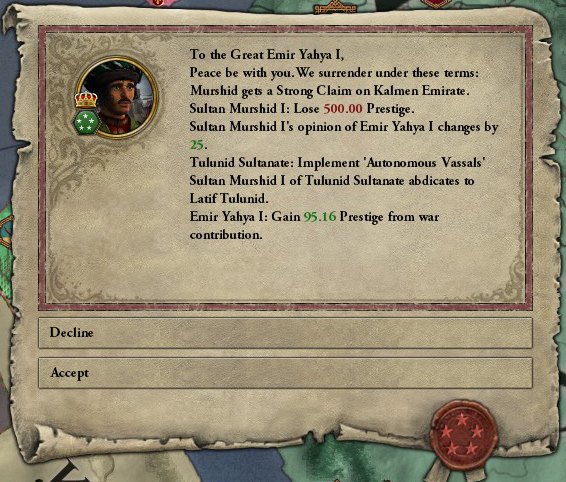 And he tried to retract my vassal. I will not be interfered with. That’s a risky move, Yayha! But exactly the sort of thing I like to see. Good work,yo! I’m not a fool. I know the risks. 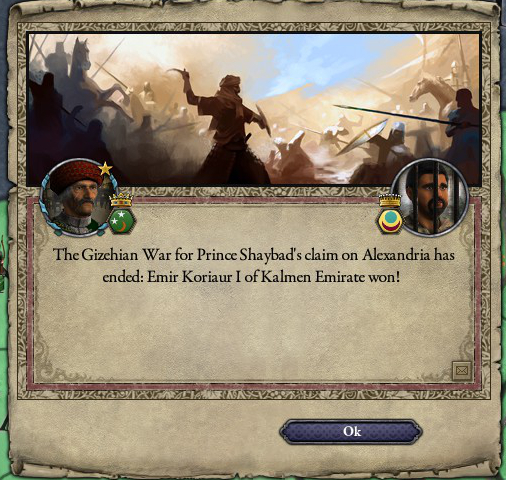 I cannot win against the Sultan’s armies, but I can call in Abbasidian allies. 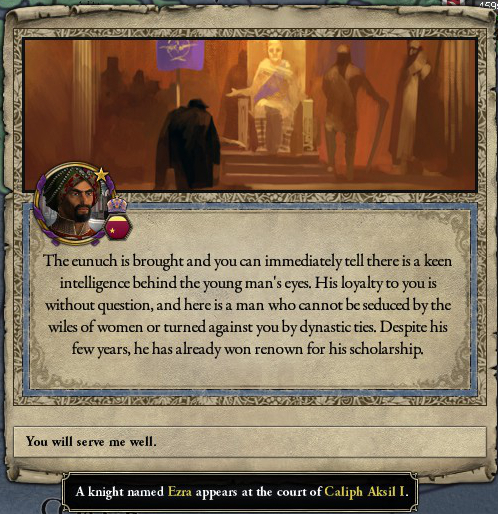 My wife is the daughter of the Abbasid Caliph. They will fight in the north while I muster in the south. In Nubia. Damn you’re fast! 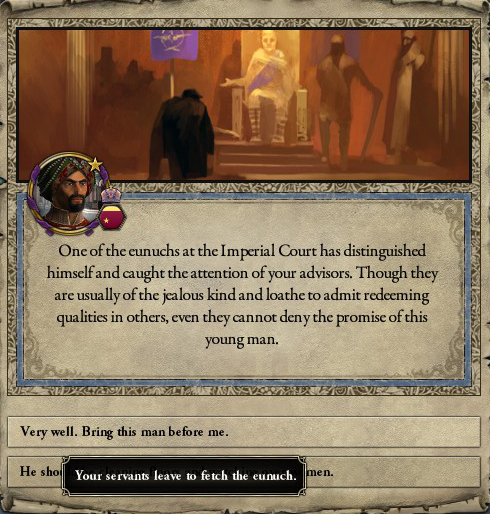 Murshid is forced to abdicate in favour of his young son Latif, who wants to make you Grand Vizier of Egypt! However, not everything is going so well. Your sons, who are now Sheikhs and Emirs of Alexandria, are all fighting one another over your fathers former direct holdings. So just let them fight? Well… okay then. I suppose more children would only add to the fracas, wouldn’t it? Sadiya, your second wife, just had a child. This brings your total up to ten, and you’re only forty years old! 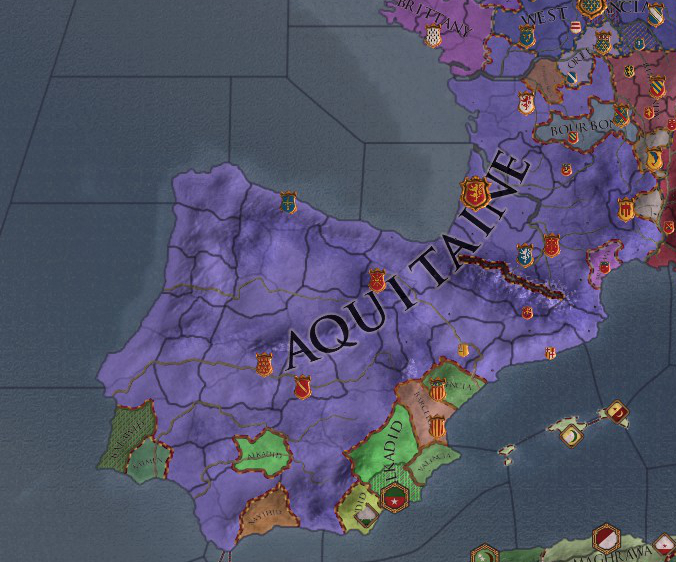 You certainly get around, don’t you? 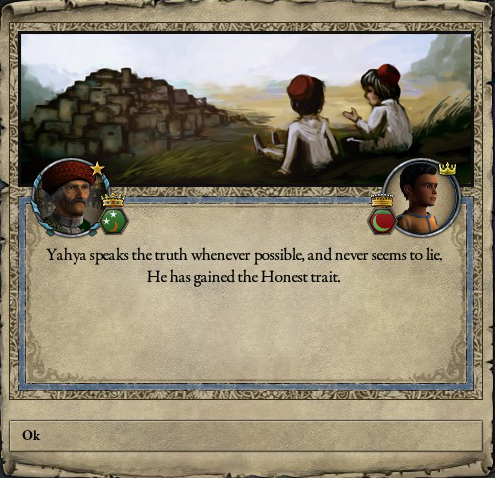 Uh, nothing Yahya. Just that you have a lot of children. One of whom is married to a woman that wants to kill you. 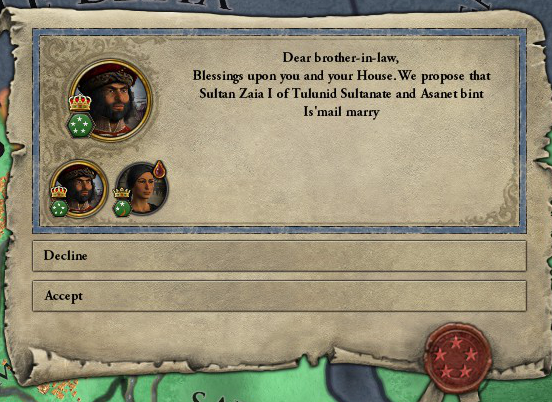 Especially because Samira is married to Nuraddin, your first son and heir. 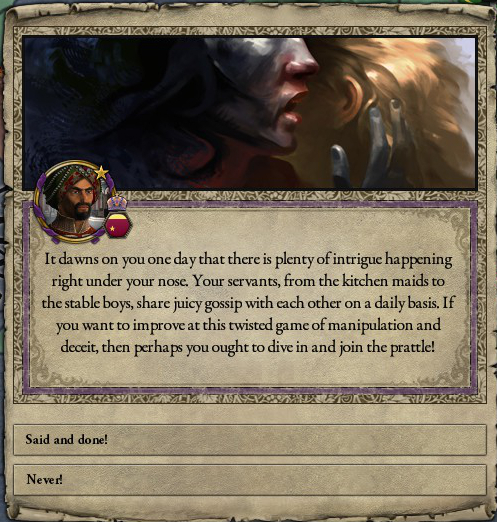 You may want to tread lightly, Yahya. If he gets upset, he might rebel, and then you’ve got troubles! I’m not sure what I’ll do with her yet. We’ll see how I feel later. Please don’t execute her! That would be bad. Know what’s not bad? More children! 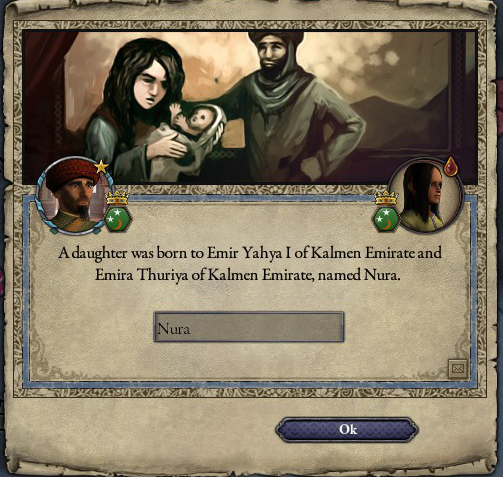 Your first wife, Thuriya, has given you a daughter, Nura. 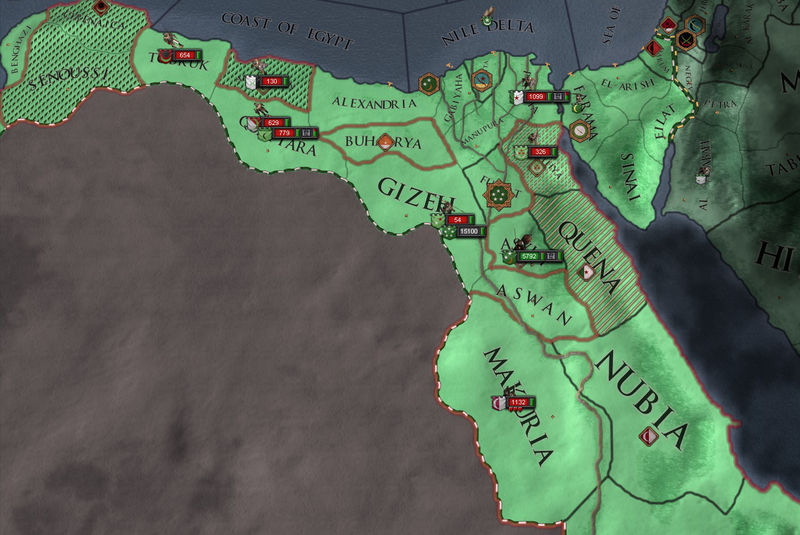 Egypt is at war. 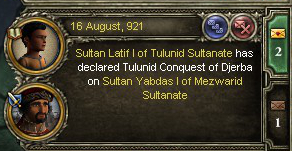 The Mezwarid Sultanate is pretty far west, meaning Sultan Latif Tulunid will be marching very far away. 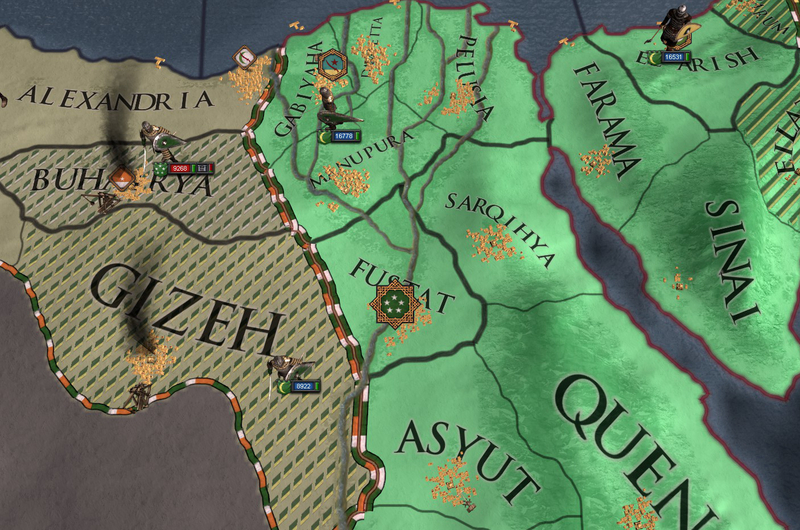 I see you’ve gained a claim on Cyrenaica, so let’s go ahead and use that. We can take advantage of the war to gain some land of our own. 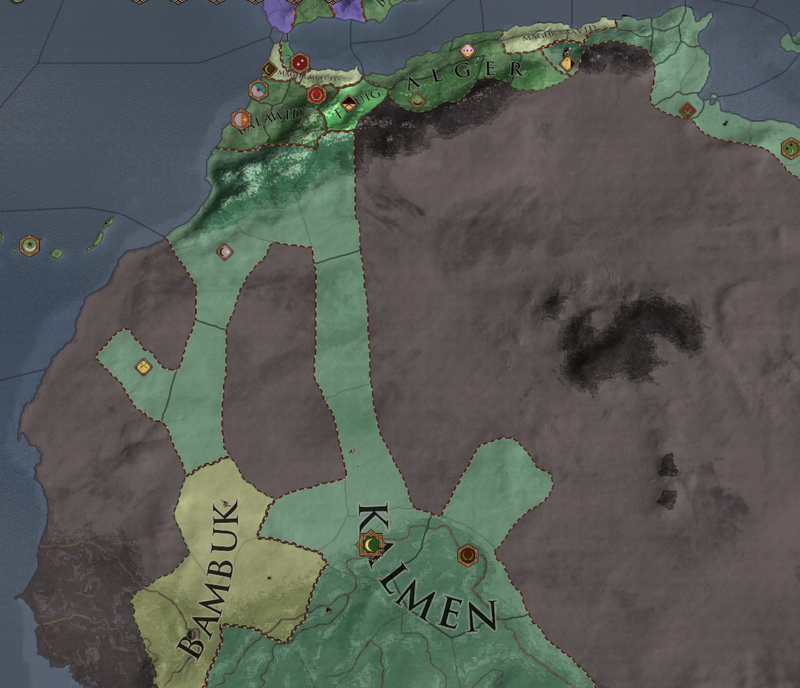 The Salamid Dynasty controls Cyrenaica, but they are vastly outnumbered by our own armies. And once again, Yahya commands a swift and total destruction of his enemies. Cyrenaica belongs to the Kalmen family now. Bitchin’ work, Yahya! 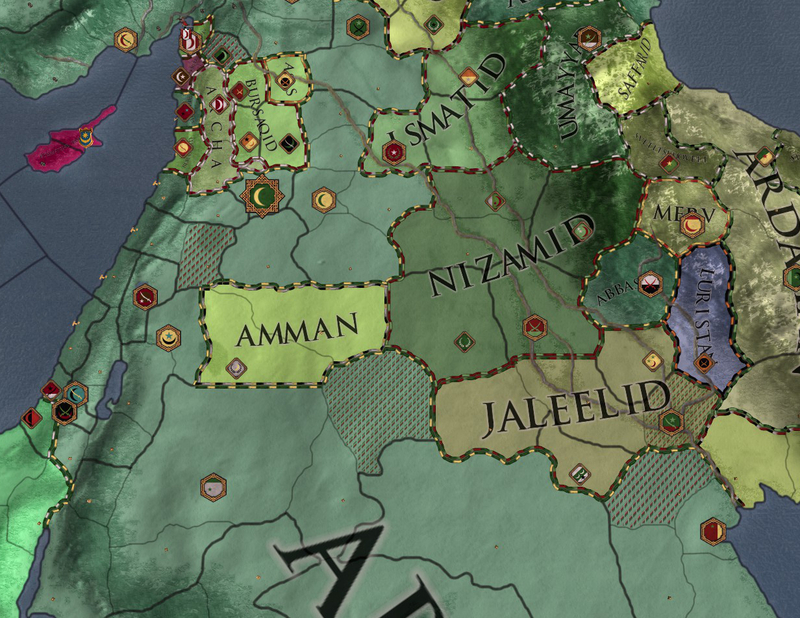 Meanwhile, the Mezwarids, through crafty marriage, have gained a bit of Umayyad land. The Tulunid war in the west is going poorly. Perhaps you have the opportunity to take some more neighbourly land? 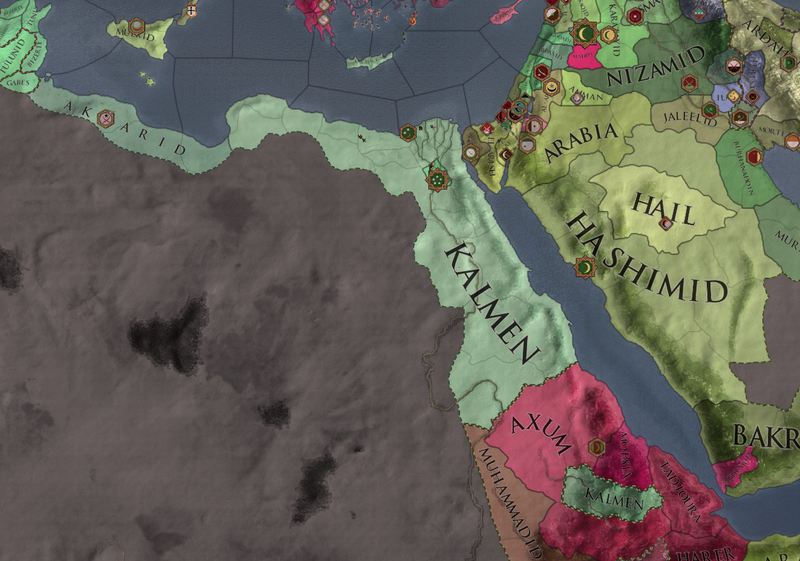 Taking a slice of the rich Egyptian centre will be a huge boon to Kalmen power. 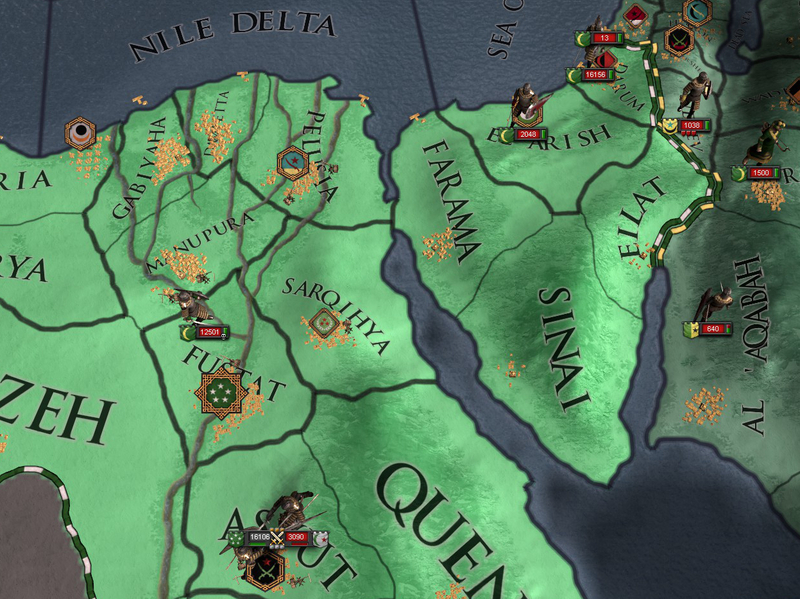 The Biktorids currently own the most populous provinces of Egypt, but you own far more land. You’re about even in numbers. 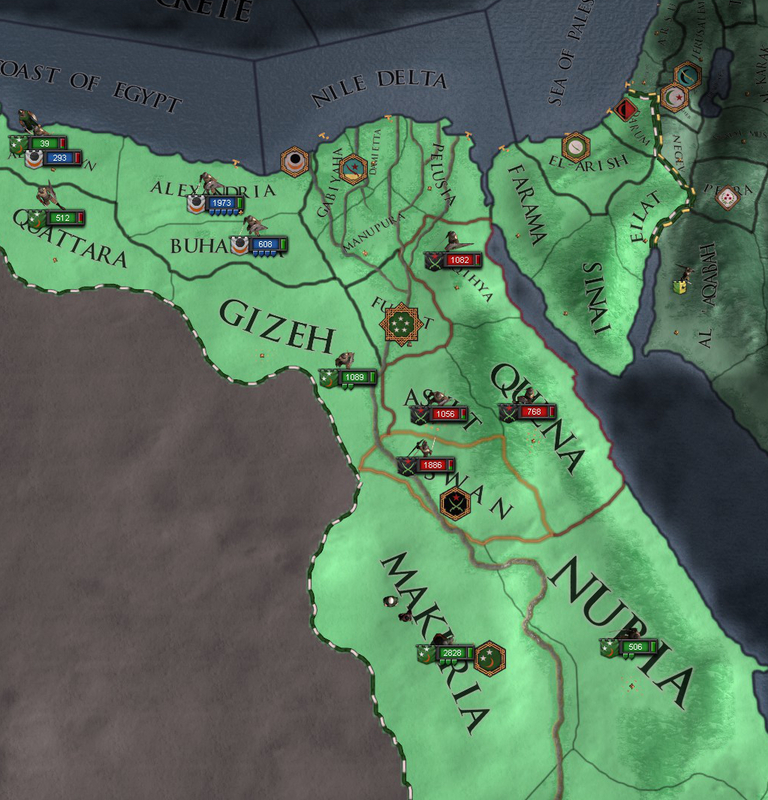 Note that the troops of the Alexandrian Emirate are not green, but blue. 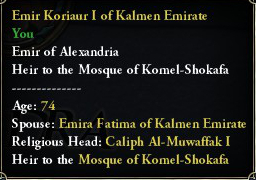 You gave Alexandria to Nuraddin, and he has formed his own branch of the Kalmen dynasty. 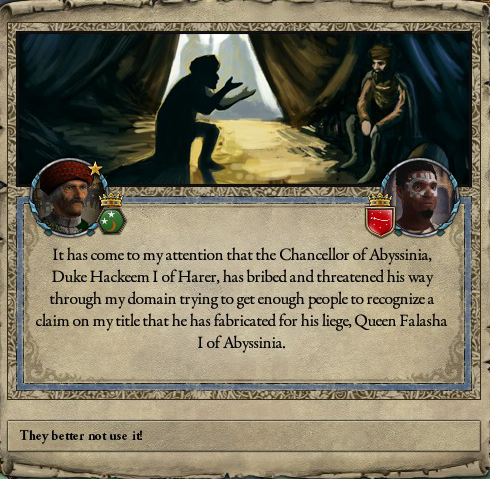 He remains your heir, however. Excellent. 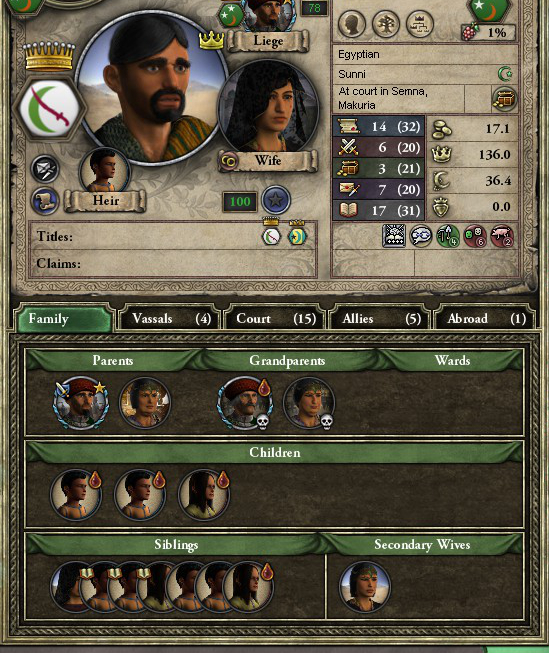 And he has the good sense to join his father in his wars. I seem to recall you and your father taking opposite sides in the Clusterfuckian War of Succession. Yet in the end, I came out on top by deposing Murshid. I like Latif much more! He is so easily manipulated. Our forces muster in Quena, ready to crush the pitiful Nubian guard. Should be easy! 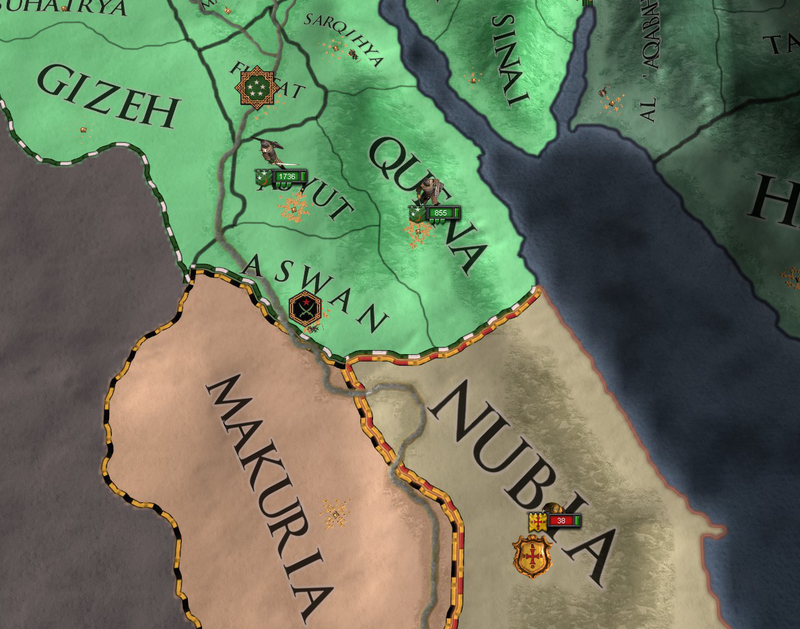 Plus, controlling Nubia will give you a foothold in any wars against the Tulunid Dynasty you shall undertake, and against Abyssinia should you so desire. I may just desire! 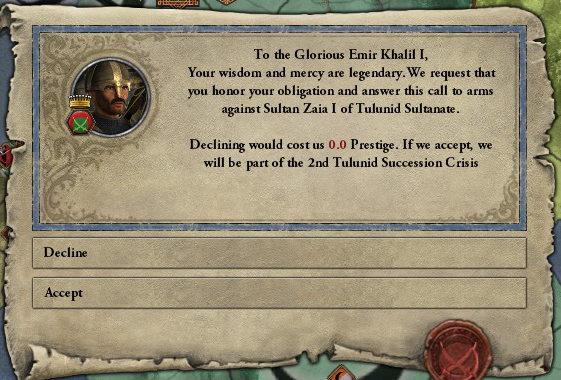 The idea of fighting my Sultan leaves a bad taste in my mouth. Well, you just do what you need to do. 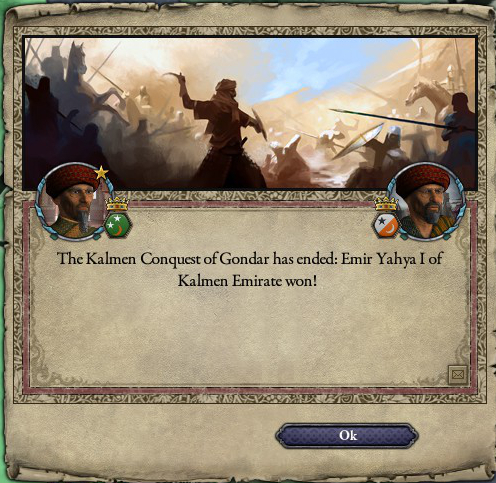 Like winning the war against Nubia! Shut up. I’m releasing Ablarion from my dungeon. Uh… why? This seems like a bad idea. 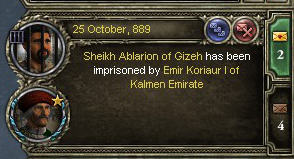 Well I’m stripping the Sheikdom of Gizeh from him first. You are thoroughly annoying, you know that? Fine, I’ll stop asking questions. You’re right, I love it. I told you so. To make matters worse, Queen Falasha of Abyssinia wants Nubia, and has fabricated a claim to get it. Raise the levies! We’ll strike the first blow. The early war goes well for the people of Alexandria, marching south along the banks of the Nile, heading for Abyssinia. 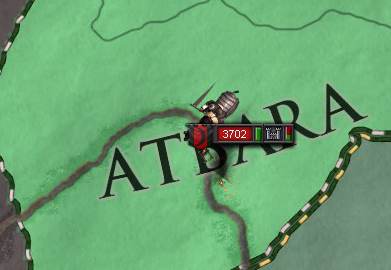 There is no resistance at the border, and the Alexandrian army makes quick progress. Abyssinian forces muster in the south, but they are not numerous enough to mount an assault on Koriaur’s army. At home, the Tulunids are facing a few issues. 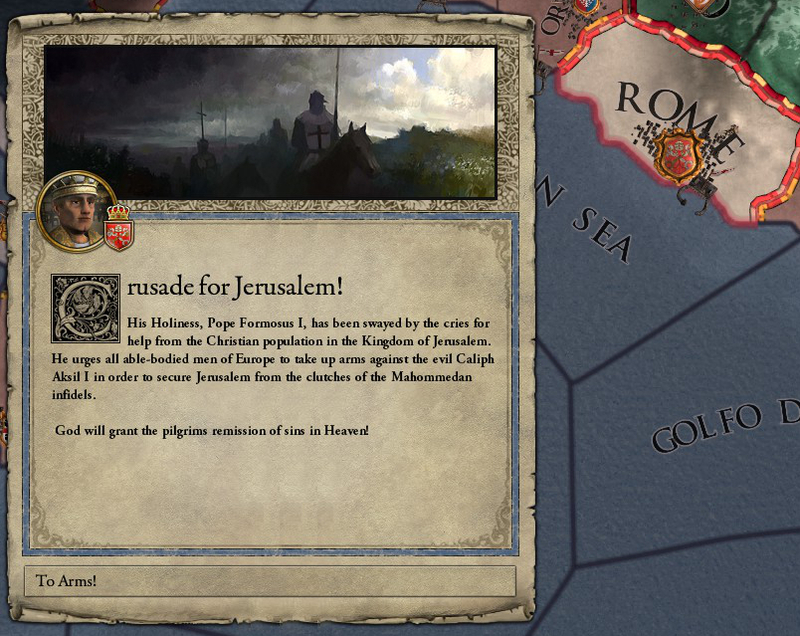 The war against Byzantium has faltered and ground to a halt, while a peasants revolt brings the economy to its knees – without farmers and craftsmen, the armies cannot be resupplied. 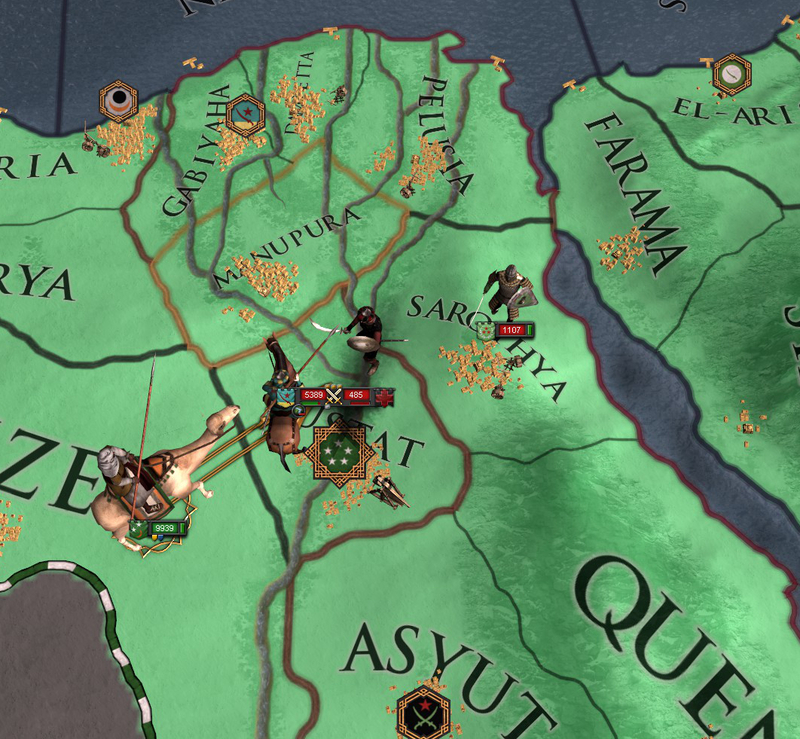 The peasants have shown no interest in disrupting Alexandrian lands, so they are safely ignored. Oh, by the way. Kor? You have a claim you can press on Tobruk. I managed to whip up a convincing forgery. Don’t worry about it! Just press the claim while you still can! Oh, and Ablarion is still being annoying. He joined the Sheikh of Tobruk in this war. I knew this was a bad idea! Hey, it was a great idea! Ablarion will be easily crushed, and you can revoke his last title, free of penalty! And on top of that, you’ll have Tobruk! I don’t even want Tobruk! Too bad, you’ve got it! 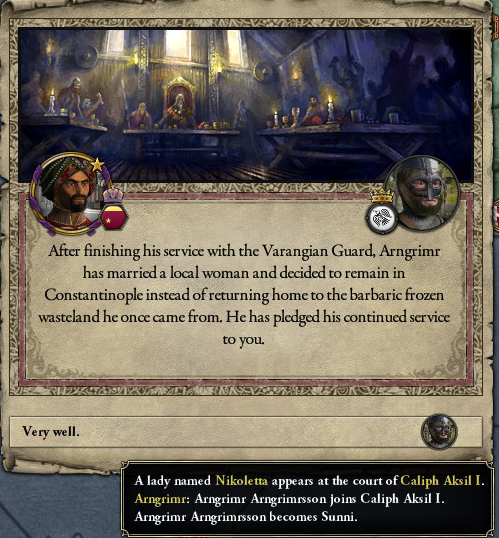 Also, your men have captured Ablarion’s son, Yared. You can use him as leverage against Ablarion in the coming months. All of your children are now of age, and you have another grandson, Ilyas! Your family is doing quite well for itself Kor! I’m a badass old man! Wait, that makes me wonder; just how old are you? We started this when you were 34 years old! 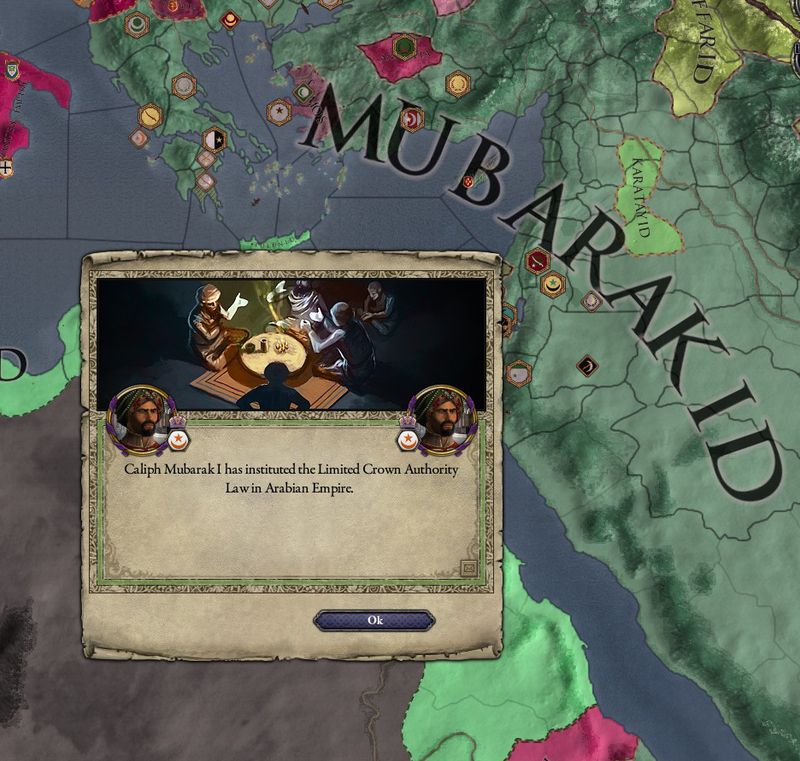 You’ve outlasted five wives, two Caliph’s, and now one Egyptian Sultan! Ahmad is dead, struck down by smallpox in his 70th year. His son, Shaybad, has taken the title of Sultan of Egypt and continued the line of the Tulunids. Shaybad is not promising. There is nothing remarkable about him. Well, there is one thing. He wants to marry your daughter. Because you’re going to go to war with him? That would be a good reason. I will not be doing such a thing! Blech, still on about that honour thing, are you? 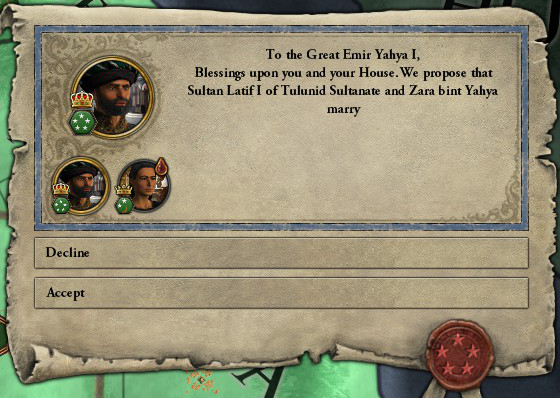 At least Yahya is turning out a bit more ambitious than you! Have you been talking to my son again? Come on, you can trust me! I’m trustworthy! You even said so yourself once! I’ll take your angry glare as a good sign. Anyway, your forces have destroyed Ablarion and the armies of Tobruk. The war is won. Something fishy is going on in Egypt, though… An assassin has killed Shaybad, then his first son, the true heir. 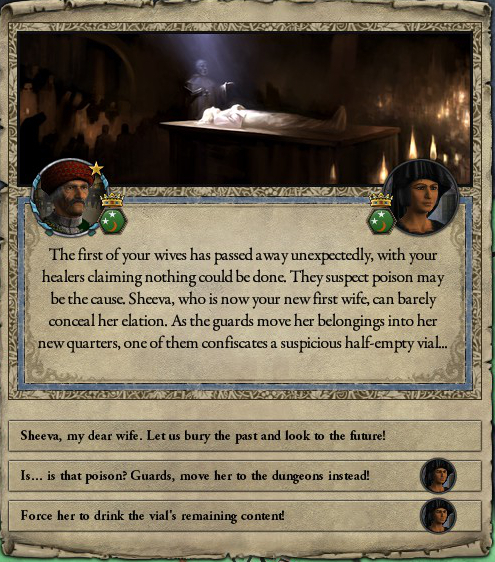 This leaves Shaybad’s second and third sons as the rightful rulers. You missed your chance, buddy. All hell has broken loose. NEXT TIME: WHAT IS GOING ON!? 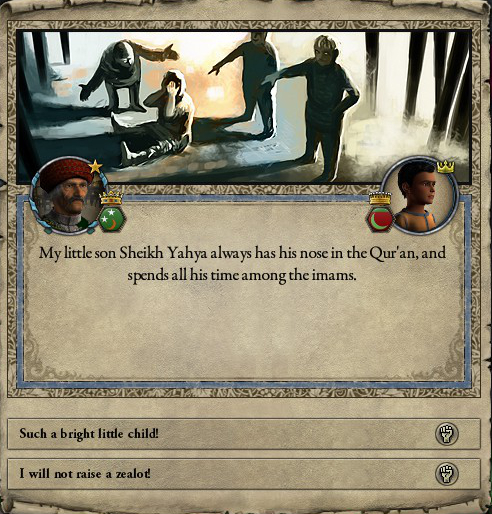 Yahya is quite the little rascal! A little curiosity is a good thing! A fine, upstanding kid! Meanwhile, your eldest daughter Andali has come of age. She is an Elusive Shadow; an excellent spy and assassin! Awesome indeed. Know what’s not awesome? 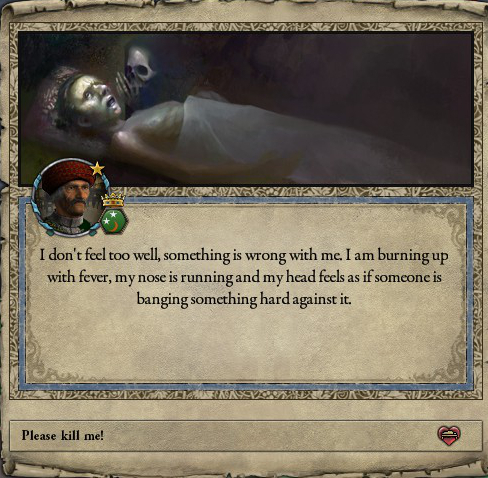 Would this be a bad time to get sick? Oh boy. Well, civil war in Alexandria, here we come! The unstable political situation has brought out the worst in everyone, it seems. Sacmis, your third wife, has murdered Samira, mother of your heir. What shall I do with her, Emir? 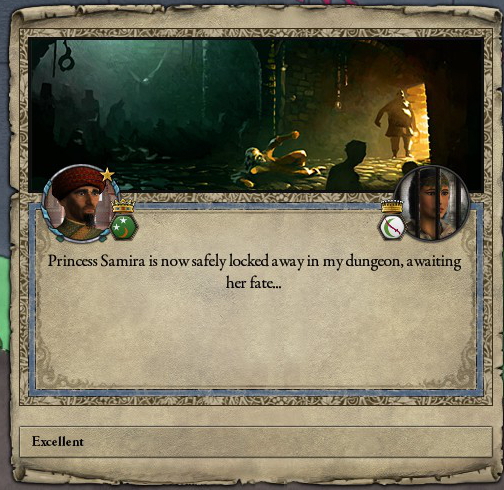 Throw her in the dungeons! I’ll think of a suitable punishment when I’m feeling better. Perhaps a public execution is in order! I think you might have been too slow. Sheeva, the young Andalusian Princess you just married like, two days ago, reached Sacmis first. 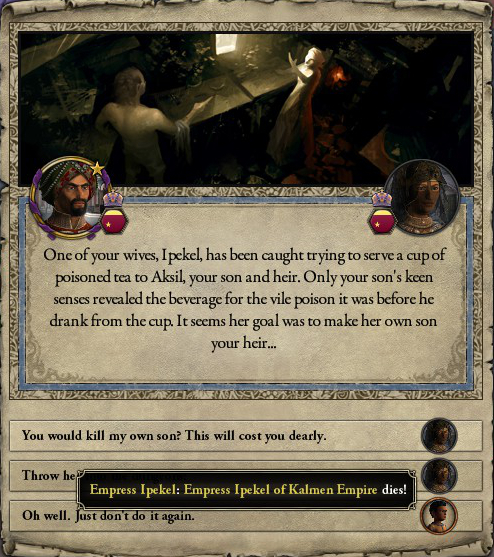 I don’t know if I should kill her or thank her. Well, you need to make a choice. I am too tired for this nonsense! Let us put this behind us. Amidst all this scheming and plotting, Asenath, your second daughter, has come of age. She’s also a bit… queer. She pays more attention to the girls of the court than the boys, and many whisper rumours in her presence. She has refused any and all suitors. 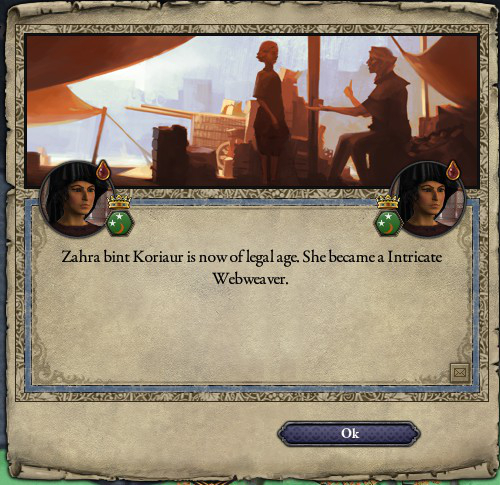 I’ll keep an eye on her. How goes the war? The war goes well! 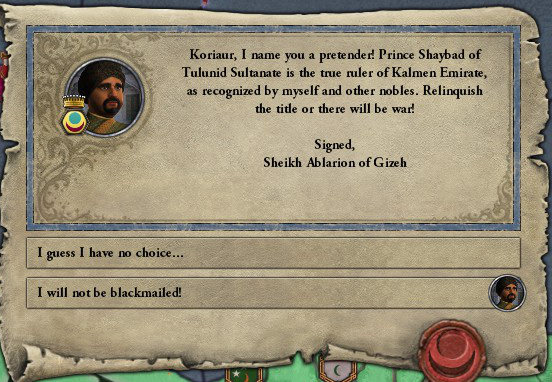 Buhairya and Gizeh have both declared support for Prince Shaybad – whom you tried to kill, remember? 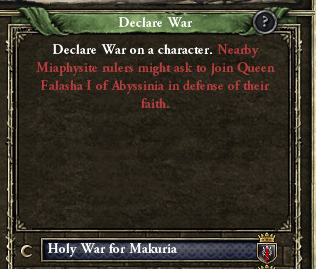 Strangely, the Prince himself has not joined in this war. Shaybad remains neutral in this conflict. It is Sheikh Ablarion who wants to see the prince rule in Alexandria. We’ve actually got quite a lot of money. And money means mercenaries to bolster our army. With this vast advantage, we are easily crushing Ablarion’s forces and besieging his castles. It won’t take long to crush him and his army. A short campaign, and Ablarion surrenders. I’m not sure I like that tone of voice. Nothing! 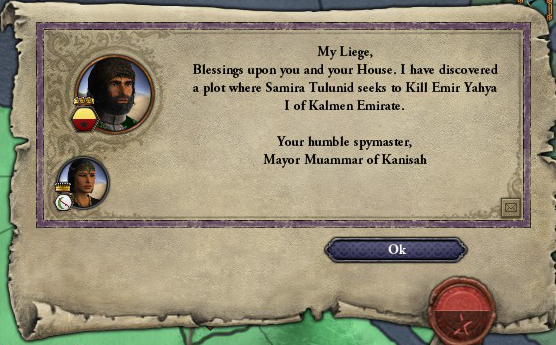 Just go about the work of ruling your Emirate. 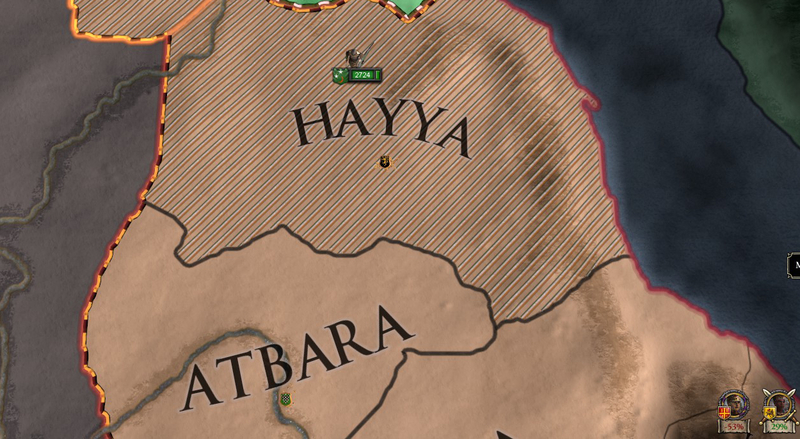 I’m going to go talk to Yahya, all right? You stay away from my son! Wait, you can do that? You stay away from my son! Oh hey, look over there! Very neat! You should arrange a marriage for her. I’m sure that will occupy your time. Good idea, voice! I’ll get right on that. 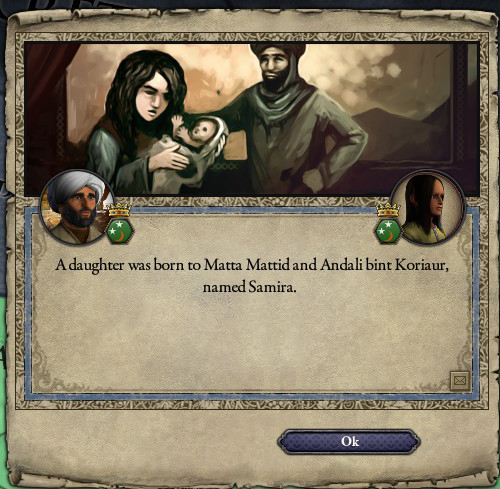 And they named her after Samira! How sweet! You are easily distracted, aren’t you? You are. Just trust me on this. Okay! 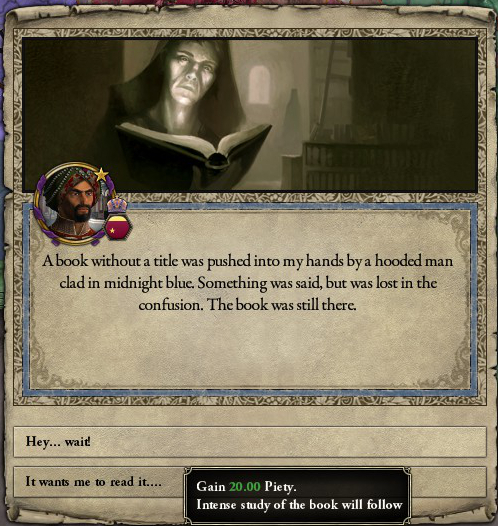 A random voice in my head seems totally trustworthy! That undersells it, I think. 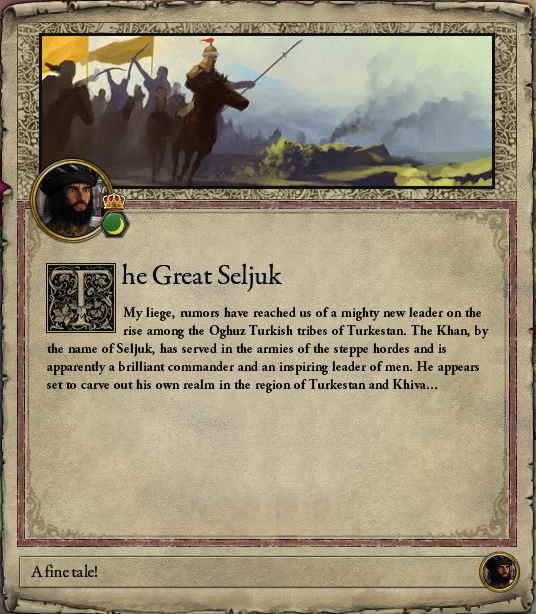 Sultan Ahmad is insane! 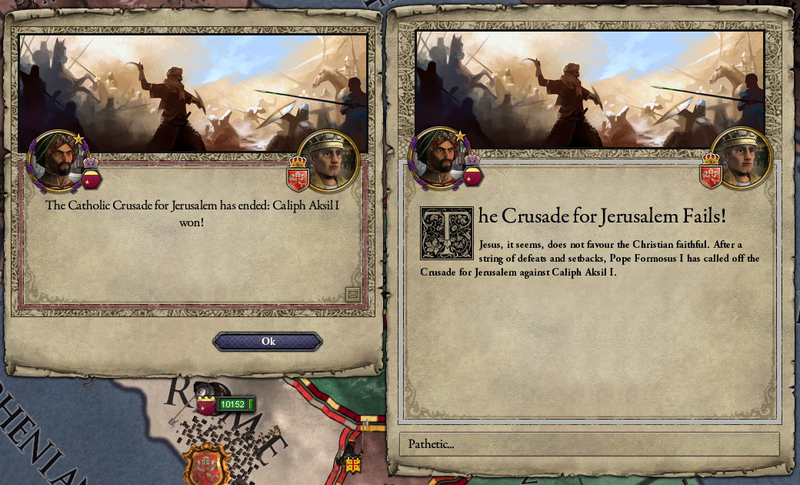 There is no way he could win a war against the Byzantines! 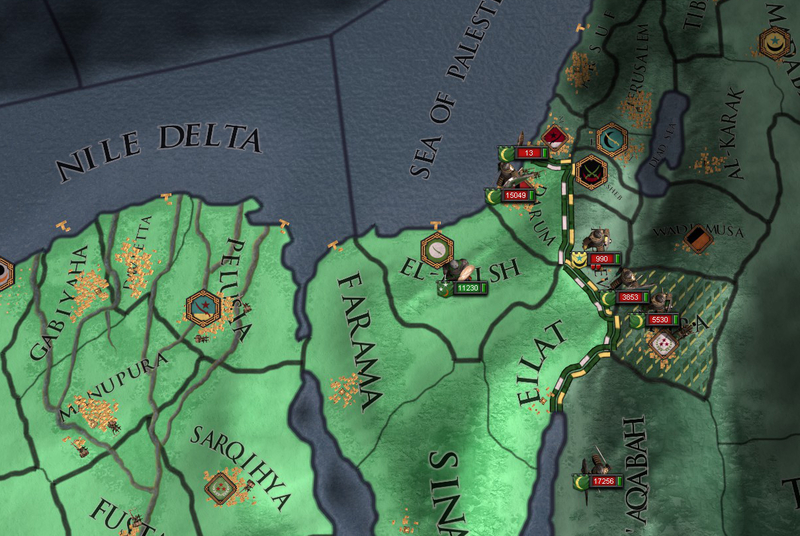 If ever there was a time to strike, it would be now, while Ahmads armies invade Sicily. That would be awful! Underhanded! 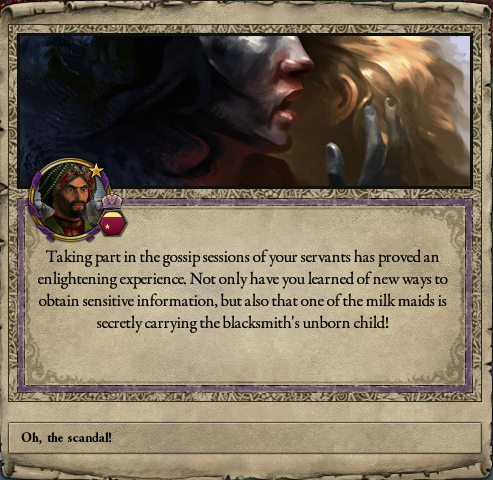 Dishonourable and vile! It would also be a good idea. That means no, doesn’t it? … I’ll think about it. Well think harder! 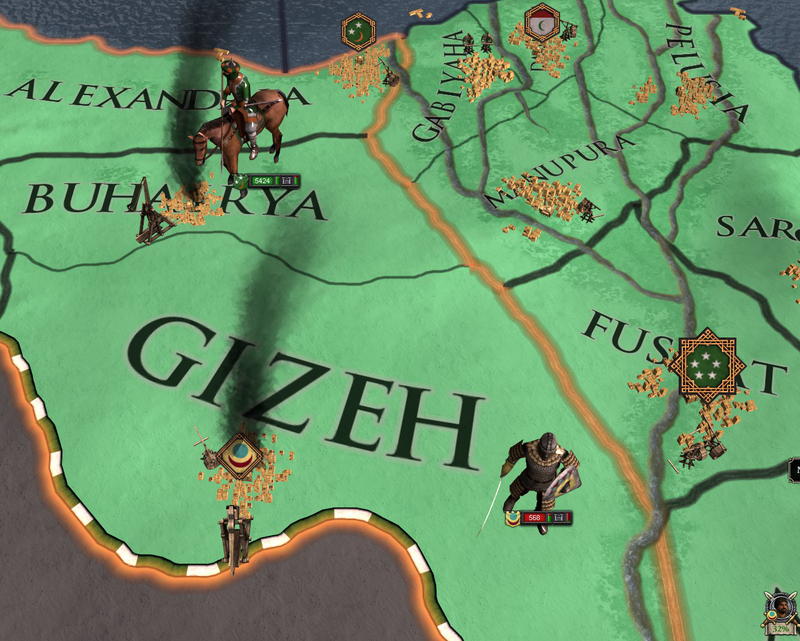 Ahmad is being crushed by Byzantine armies! I actually have a better plan. 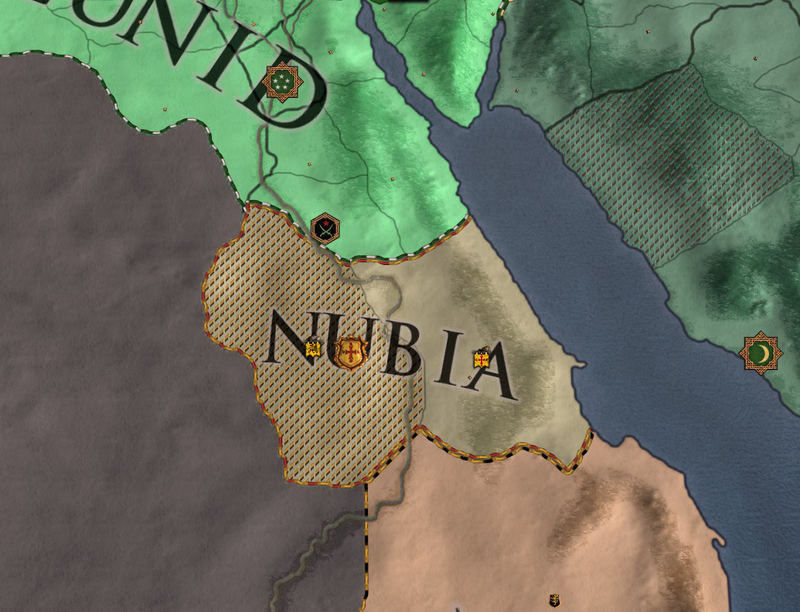 Nubia is weak, but holds rich lands. 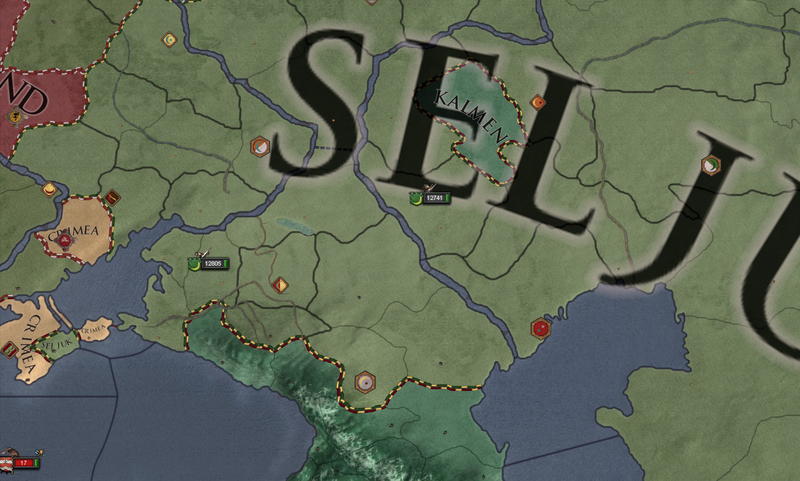 Taking those lands for myself would gain me prestige and access to southern troops. 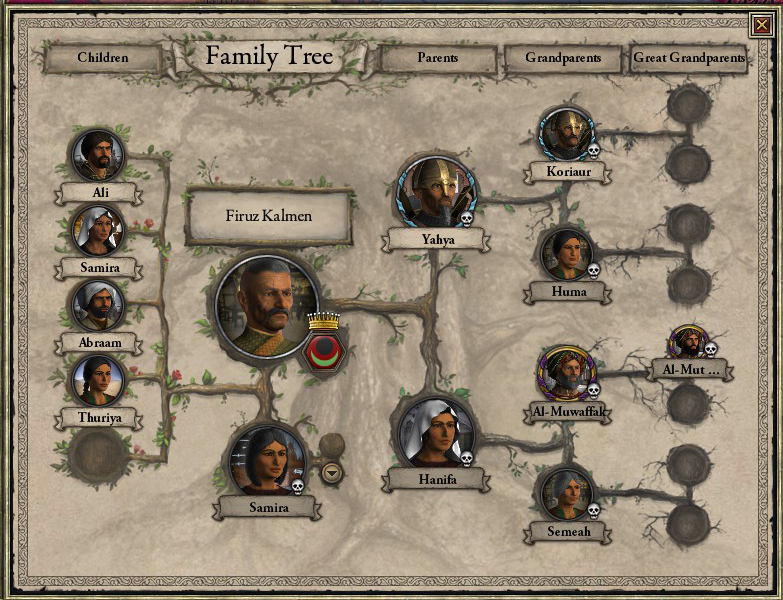 The Kalmen Dynasty would be strengthened! Surrounding the Tulunids! I like it! That’s… dastardly! Nice to see you’ve got your head in the game after all! NEXT TIME: The Invasion of Nubia!